CONCORD, N.C. -- Just like that, Jimmie Johnson has a seventh championship within reach. 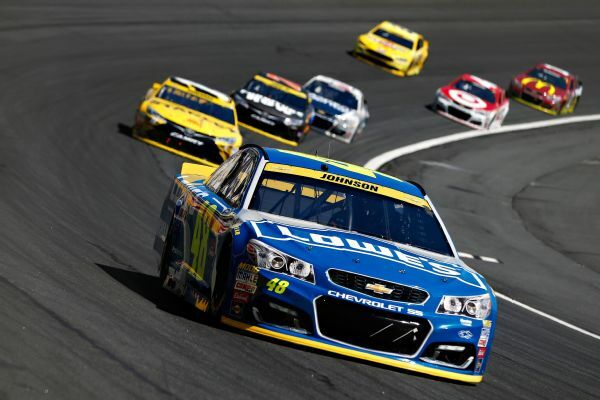 Johnson salvaged a ho-hum season with a strong win Sunday at Charlotte Motor Speedway that moves him into the third round of the playoffs. The elimination format had not been good to the six-time champion since its 2014 inception: He was eliminated in the second round of the inaugural year, then bounced out of the first round last season. Johnson snapped a career-worst 24-race losing streak while winning for the first time since March. "I just knew it was taking way too long," he said of the drought. He has quietly turned it up through the first round of the Chase and became an official title contender on Sunday, a day in which nearly half the Chase for the Sprint Cup championship field had trouble. Denny Hamlin and Kevin Harvick both had engine issues. Austin Dillon and Chase Elliott were in crashes. Joey Logano had tire problems, and Martin Truex Jr.had an electrical issue as he left pit road after the final pit stop. Johnson, meanwhile, has a record eighth victory at Charlotte and a spot in the round of eight drivers. He doesn't have to worry about tire trouble, mechanical breakdowns or a wild ride at Talladega Superspeedway in the elimination race later this month. Johnson is through to the third round, and many of the top names are in trouble. Although Truex salvaged his day and finished 13th -- lowest of the Chase drivers still running at the end of the race -- Hamlin wound up 30th. Hurricane Matthew had washed out most of the weekend at Charlotte and pushed both the Sprint Cup and Xfinity Series races to Sunday in an 800-mile doubleheader. Scheduled for both races were Harvick, Logano, Dillon and Brad Keselowski. HENDRICK RETURNS: This had been a miserable season for Hendrick Motorsports, by its own standards. Only two of its four drivers made the Chase this year, and Dale Earnhardt Jr.is sidelined with a concussion. Elliott was involved in a crash with 75 laps remaining and could not hide his disappointment. HAMLIN WOES: During a lengthy red flag, NBC Sports interviewed Hamlin while he idled in his car and said he was just cruising along for a strong finish. "It's just my time," he said with a shrug. He seemed to get off cleanly at the drop of the flag, but as he shifted, he was hit from behind by Truex and went spinning into an interior wall.